National Super Alliance leader Raila Odinga is set to be sworn in as the ‘people’s president’ in front of a million of his supporters. 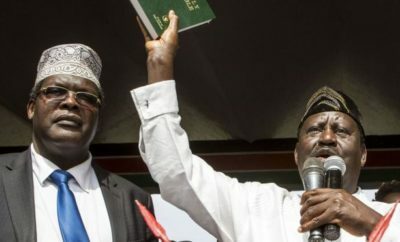 Raila, who was the Opposition’s presidential candidate in last year’s August 8 General Election, is expected to be sworn in alongside his running mate Kalonzo Musyoka on Tuesday, January 30, at Uhuru Park in Nairobi. 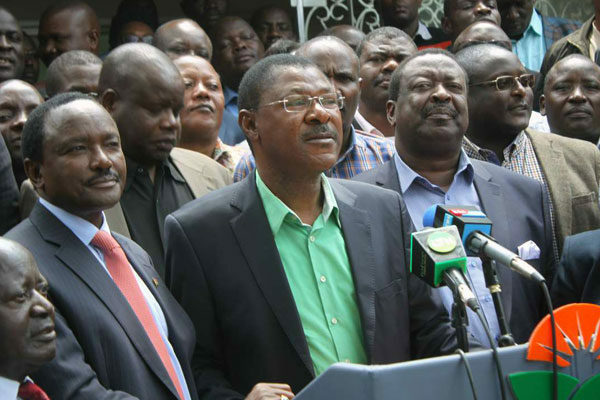 Sources within NASA said the four principals, Raila (ODM), Kalonzo (Wiper), Musalia Mudavadi (ANC) and Moses Wetang’ula (Ford Kenya) were working with elected and non-elected leaders to plan for the big day. The Standard has reliably learnt that before the ceremony, NASA is expected to announce presidential results of all the constituencies, according to data the Opposition says it gathered from the August 8 elections. The Opposition has maintained that it won the election. A petition it filed at the Supreme Court challenging the election of President Uhuru Kenyatta saw the election annulled on September 1, 2017, over irregularities in the manner the Independent Electoral and Boundaries Commission (IEBC) conducted the poll. The court ordered for a repeat poll which was held on October 26. Raila however refused to participate in the repeat poll that was won by Uhuru. “When we moved to the Supreme Court to challenge the presidential vote results, we knew that we had won. We had the figures which we will announce to Kenyans to show them that we won but our vote was stolen,” a source within NASA said. Multiple sources within the coalition also told The Standard that the alliance was expecting a million of their supporters from across the country to converge in Nairobi a day before the ceremony. “All our elected leaders including governors, senators, MPs, Members of County Assembly (MCAs) and member party officials will mobilise supporters and provide logistics for them to come to Nairobi,” a source said. All elected leaders and party officials have been ordered to mobilise at least two busloads of their supporters to the city for the occasion. MPs have been asked to get more involved in preparations for all people’s assemblies in remaining counties, a task that had previously largely been handled by the technical team. According to the sources, NASA supporters who will come to Nairobi will not leave immediately after the ceremony as the Opposition wants them to be part of the post-swearing in activities. “After the swearing-in, NASA will ask our supporters to occupy Uhuru Park after the ceremony beyond January 30 so that they can launch the people’s convention within Nairobi before going back to their counties,” a source said. Contacted for comment, NASA Chief Executive Officer Norman Magaya refused to divulge details but maintained the swearing in was still on course. “We want our supporters to witness as we form government by naming the cabinet and other constitutional offices immediately after swearing in our leaders,” Magaya said. On course He said NASA’s assumption of office team had already assembled and was working daily to ensure everything would go according to plan. “We are on course and this is going to shock Jubilee and the whole world. We want to demonstrate to the world that you cannot rule people by force when they reject you,” said Magaya. Sources within the coalition indicated NASA principals had asked MPs spearheading the Resist Movement, to restart product boycotts next week. “We have done our research and we have more companies to add to the initial list of companies. From next week, we will be calling upon our supporters to boycott their products because they are associated with Jubilee,” said an MP who is a member of the Resist Movement. 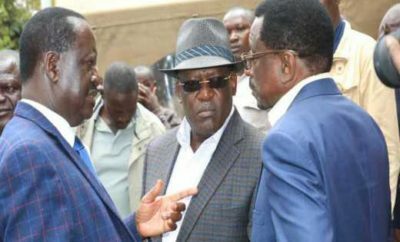 Although NASA has maintained that its plans to swear in their leader are on course, there have been concerns for the safety of its leaders and supporters should there be a confrontation with security agencies on that day. When reached for comment, Kakamega Senator Cleophas Malala said the Opposition had made arrangements for any eventualities. “We are exercising our constitutional right and this is not criminal. Let Jubilee charge Raila and Kalonzo with treason. We are also warning police not to be brutal because they will be charged in court as individuals,” he said. The NASA team is expected to head to Machakos today as they drum up support for the ceremony. “The Machakos event brings together all the Ukambani counties before we move to Mombasa. NASA supporters are pushing their leaders to take oath of office. They can’t retreat now,” said Makueni MP Dan Maanzo. From Mombasa, the NASA brigade plans to move to Suswa in Narok, before heading to Nyamira, Migori and Kisii counties. The Opposition has remained adamant that it is not interested in joining a coalition government. Coalition government The Alliance’s strategist David Ndii yesterday dismissed talk of a coalition government with Jubilee. “We are not interested. We have made it clear that we do not recognise this regime and we are not prepared to help it out of its own mess,” Mr Ndii said. In a statement sent to newsrooms, NASA people’s assembly organising committee was categorical it was prepared to swear in Raila. Ndii is a member of the committee. “We wish to assure our supporters that the swearing-in is on and all arrangements are in place to make it the most significant event our citizens have ever organised for themselves to secure their interests, rights and dignity as a people,” said Ndii. 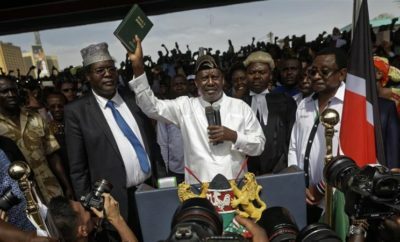 He said the swearing in is a reclamation of the NASA presidential election victory of August 8, 2017 which the Supreme Court validated by annulling Uhuru’s victory.